Heart failure is a debilitating and challenging condition for patients, especially as the disease tends to afflict a senior citizen population. Moreover, this ailment is an enormous time and cost strain on the healthcare system. This problem is largely a result of the consistent need for health checkins and the expensive nature of care. 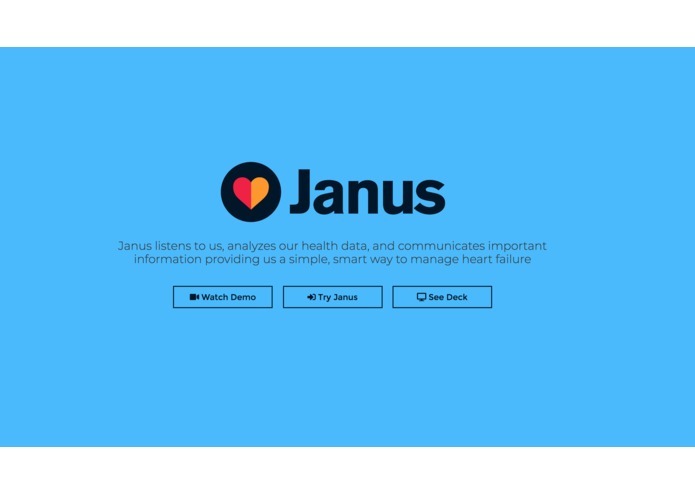 Janus is an assistant for heart failure patients that automates a lot of the challenges dealing with heart failure. 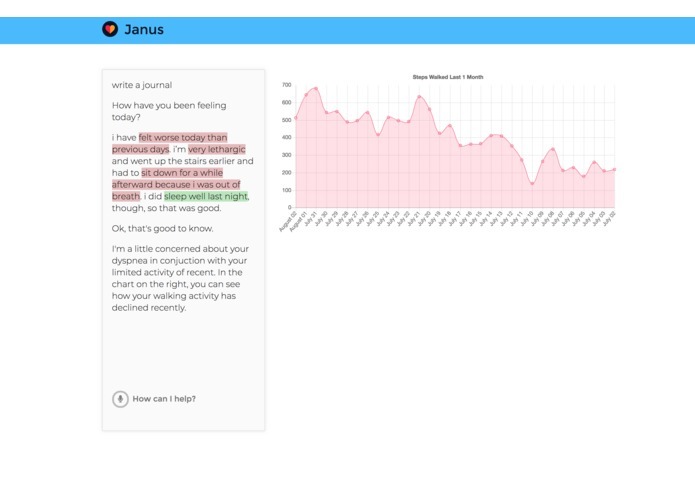 Janus also accumulates and digests to better understand each patient’s personal condition, and using that data can make certain predictions of upcoming complications. These tools allow Janus to eliminate unnecessary health interventions, or engage a health intervention when data suggests it is necessary. 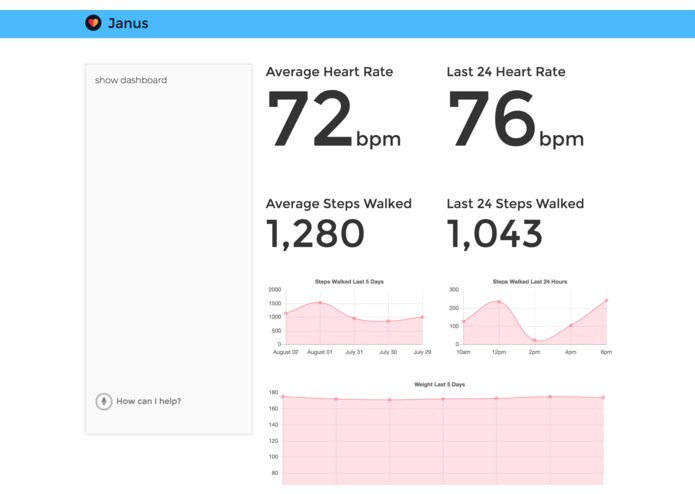 Through a more complete picture of patient challenges, Janus can simultaneously relieve strain on the healthcare community while also improving quality of life for patients through a simple, easy to use interface - just by talking to it. 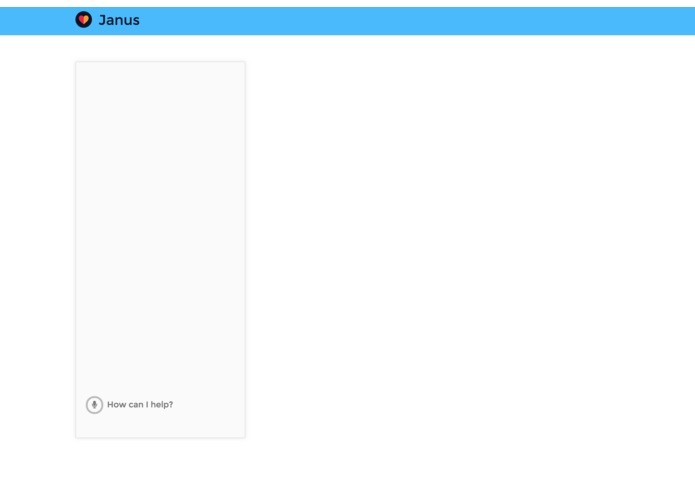 Janus is created as a cloud software application, built in Ruby on Rails, hosted on Heroku, and leveraging serveral web services such as Microsoft's Cloud and AI technology for speech, as well as twilio and other libraries for charting and style. Simplifying the management of heart failure is not a simple task. The biggest challenge was speaking to the right individuals and collecting enough knowledge from the healthcare community to understand the problems in managing heart disease that are ripe for technological automation. There is a large opportunity to mitigate the time and financial cost of managing heart disease through advanced technologies. This is a great opportunity for several entities - the patients who may improve their wellbeing using Janus but also the healthcare system would benefit greatly from lessened strained on an already resource-constrained envrionment. I would like to continue developing Janus with the advice and mentorship of Novartis. The most critical needs moving forward are individuals who are knowledgeable in the space and can provide insight and direction as the product continues to evolve and grow into a more complete solution.